Recently discussed at the Madras Book Club was a new detective story series of special note because the stories are based in Madras, a first for a foreign author and a first in a Madras-based setting being published abroad. 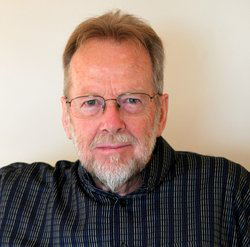 Brian Stoddart, the author, is an Australian academic, the detective is Supdt. Christian Le Fanu, ips, Madras Police, the setting is Madras in the 1920s, and the publisher is in Hong Kong. A Madras Miasma is the first in the series, The Pallampur Predicament is the second, and a third is on the way. 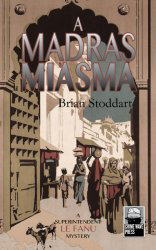 Brian Stoddart and his first crime story, its setting Madras in the 1920s. Stoddart came to Madras first in 1972 to research a PhD thesis on nationalist politics in the old Presidency between the Wars. That took him into the archives in Egmore and into interviewing people like Rajaji’s son. Among his first landlords (in Nungambakkam) was a man who became a policeman in the 1930s and an IGP later, V.R. Rajaratnam. Every day in the archives, Stoddart would try and find a case from where Rajaratnam had been in the 1930s, then they would sit outside in the evenings and he would reminisce about arresting people like Rajaji’s son, C.R. Narasimhan. He published a few things based on what he found in the archives, but then became more known as a pioneer in the academic study of sport: he wrote one of the first accounts of the 1932-33 Bodyline tour, wrote some of the first cultural analyses of cricket in the Caribbean, did a history of the Royal Sydney Golf Club, wrote some early stuff on sports, politics, etc. Then Stoddart got into academic management and later became a Vice-Chancellor of La Trobe University, Melbourne, but India and Madras always remained a great love, so he got around to writing a book on the evolution of Andhra Pradesh, and a biography of A.M.A.C. Galletti who was the classic square peg in the round hole of the ICS. Meanwhile, he was always a great crime fiction fan. About three years ago, while on a long-term assignment in Cambodia (he still does a lot of higher education reform work), he began thinking that crime fiction based in South India would allow him to tell some stories in a different way, using all the material he had, and that led to A Madras Miasma. “Le Fanu I wanted to be different, so I gave him an exotic background. The whole aim was to see him out of the prism of the monolithic Raj, because there were people who were open to change and genuinely interested in India getting independence,” Stoddart says about his India-sympathetic character. So Stoddart came back to Madras while writing Miasma and buzzed around in an auto with his camera and notebook, taking in the living city, as it were, trying to imagine Le Fanu in that space. It was huge fun ‘rediscovering’ places he had known before, he says, but in a different way: visiting the churches, sneaking into the grounds of the club that once was Adyar, getting into the stacks at the Museum library, walking through the markets and the business streets in George Town, seeing what was left of the mansions in the ‘name’ suburbs, going to the temples and rummaging through musical instrument shops in Mylapore and all the rest. ‘Supdt. Le Fanu won a Military Cross in the great war, but the War changed him. He suffers nightmares and elements of what is now called post-traumatic distress disorder. That is manifest in his phobia about blood, an awkward problem for a murder investigator required to attend autopsies. His father would rather have been an academic than a schoolteacher, and expected his son to at least join the elite Indian Civil Service, and was seriously displeased when Le Fanu set himself for the police. So Le Fanu goes to Madras as something of a loner, makes a bad marriage that the War turns into a divorce, and when we first encounter him he is in relationship with his housekeeper, an Anglo-Indian. Le Fanu is an able policeman but an awkward person, and that is aggravated by his war experiences in which he comes to learn a lot more about the Indians under his command. This gives him a greater sympathy for the activities of the Indian National Congress and Mahatma Gandhi. Those views also set Le Fanu for clashes with many but not all his colleagues. One of the aims here was to show that there were, in fact, people in the Raj who were more progressive than others. In the mid-1920s in Madras, as I mention in the novels, another ICS man called Hilton Brown, who was also a writer, produced a couple of novels that seriously questioned the imperial project. Similar mavericks appeared all over India. Le Fanu, then, reflects an alternative strand that was present in the Raj, but he does also have a streak of humanity that is timeless, hopefully. Le Fanu places a great deal of faith in the methods of Hans Gross, an Austrian researcher regarded widely as one of the pioneers of modern criminal investigation methods, and his Criminal Investigation and later Criminal Psychology Theories were taken up around the world from the late 19th Century onwards, having proved successful in his home country. I discovered that, early in the 20th Century, two European lawyers based in Madras produced an Indian edition of Gross, and that gave me the idea of introducing another element into the crime books: the tension between old and new approaches to analysis in the middle of changing social and political contexts. The name Le Fanu is no figment of author Brian Stoddart’s imagination. He says he first came across it in the Madras records, where there was mention of an ICS officer by that name. William Joseph Henry Le Fanu was born in 1843, son of the Rev. William Le Fanu, Rector of St Paul’s in Dublin, and grandson of the Rev. Peter Le Fanu who was a playwright among other things. His uncle Sheridan Le Fanu was famous in his time for his horror stories. Henry’s great-grandfather Guillaume Philippe Le Fanu was a Huegenot who came over to Ireland from France. Henry Le Fanu was a BA from Trinity College, Dublin, and a lawyer. He joined the ICS in 1865. As Collector of Salem District, he wrote the Salem District Manual. He eventually went on to serve as an Additional Member of the Madras Legislative Council. He retired in 1900 and moved to Hyderabad to practise Law.